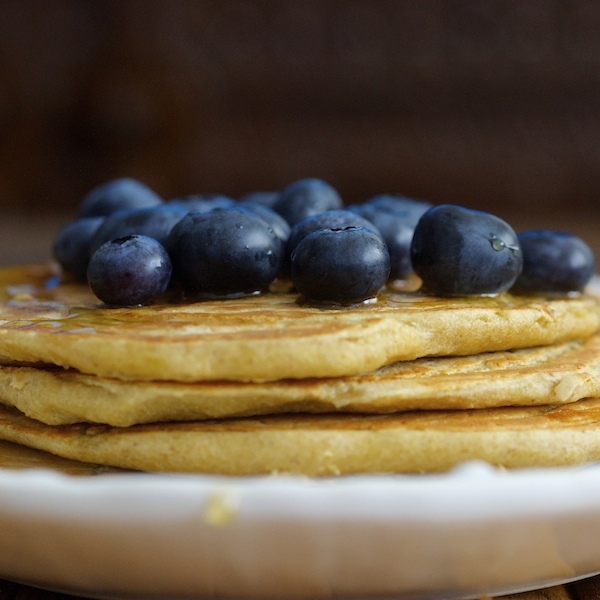 These Healthy Gluten Free Oat Pancakes felt like the perfect fresh start for this new phase in my life. I feel I’m finally here, I have arrived. I have been slowly building a new life in Austria and for those of you who have also been leading an expat life, you know how much time, energy and open mind you need to do this every few years. It is not only a new country, a new house and even a new language, it is also reinventing yourself over and over again. Many of us have families that require our full support, attention and help settling down. Many times you forget about yourself in the process. You are too busy, too tired and there is so much to learn it can be overwhelming. You feel there is so much you can’t do anymore. You think about the previous country, longing for those seemingly longer, sunnier days where everything was possible. You also long for those people, their language you could speak, their kindness and warmth. Then one day, you stop, you look up from your camera viewfinder and start seeing the beauty. You receive guests from a sunnier place and they make you see everything with a new light. You feel the storm is calming and you can find yourself on the other side. Spring is here, markets are bustling with activity and produce. You think about all those healthier breakfasts that you already put out there and all the great food you are proud to have cooked. Just a few words on the oats being or not gluten free. There are some opinions that factory brand oats may get contaminated sometimes by being in contact with other types of cereals and flours. I bought gluten free organic oats so I’m absolutely sure they are gluten free. To make the oat flour is very easy. You weigh the amount of oats needed, you put them in a blender or food processor and pulse a few seconds (usually not more than 10-15 seconds) until you have the consistency of fine flour. Peel the banana and then mash it well with a fork. In a bowl, combine the oat flour and baking powder. Make a hole in the center. Add the mashed banana, the vanilla extract, the vegetable oil and the egg. Pour the milk slowly, stirring constantly until you get a smooth, fine batter. Warm a non-stick pan to medium heat. Melt a bit of organic butter to line the pan. Add one soup ladle of the batter to the pan and cook until bubbles start appearing on the surface. Turn the pancake and cook on the other side for 2 or 3 minutes more. Repeat the process until you’ve used all the batter. 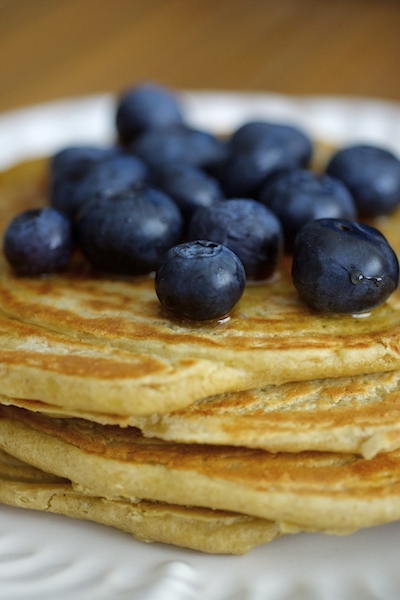 Sprinkle each pancake with cinnamon (optional) and top it with blueberries. Serve warm with honey. So healthy, tasty and incredibly easy to make, enjoy! Thank you Ado and you would be welcomed! I am very happy to receive your recipes again. I tried the other day the fish you made when we were with you, and it was very good, not as good as yours but good. Thank you Carmen for your support and I’m glad you did it, I’m sure it was good.